I have watched Indiana Jones and the Last Crusade many times over the years, and goodness, how this film holds up! It’s just a really solid — and really re-watchable — action adventure movie with romance and comedy perfectly mixed in. It’s the third film in the series, and in this installment, Indiana Jones (Harrison Ford) sets off to find the Holy Grail… and his missing father (Sean Connery), who is also a professor and historian. Such good casting! 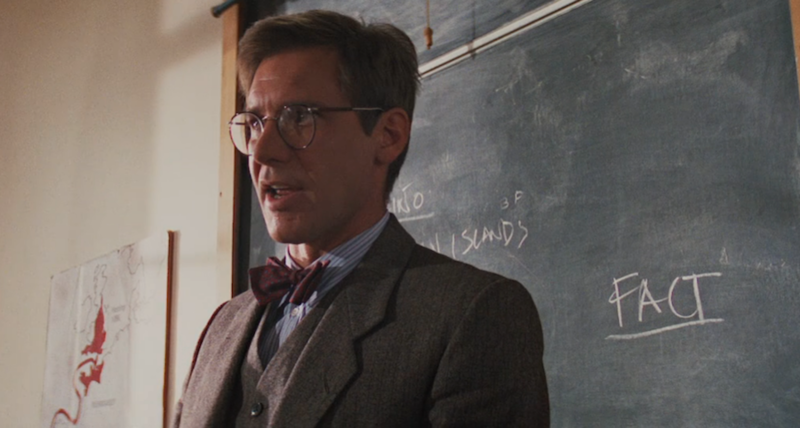 FACT, Indiana Jones is still very handsome in a three-piece suit and polka-dotted bow tie. FACT. Why is this speech so important? Not just because of the focus on the library, researching, and reading — that’s all gravy! — but because this character is setting up the rest of the film’s plot for us. Even though he’s in denial, we viewers know we’re set for lost cities, exotic travel, maps to buried treasure… and libraries! Flash forward 10 minutes, almost to the half-hour mark of the film, to when Indiana Jones goes to Venice to meet Dr. Elsa Schneider (Allison Doody). She takes him to where his father was last seen, a local library. Elsa Schneider: I have something to show you. I left your father working in the library. He sent me to the map section to fetch an ancient plan of the city. When I got back to his table, he’d gone, with all his papers, except for that scrap, which I found near his chair. Here is the library. 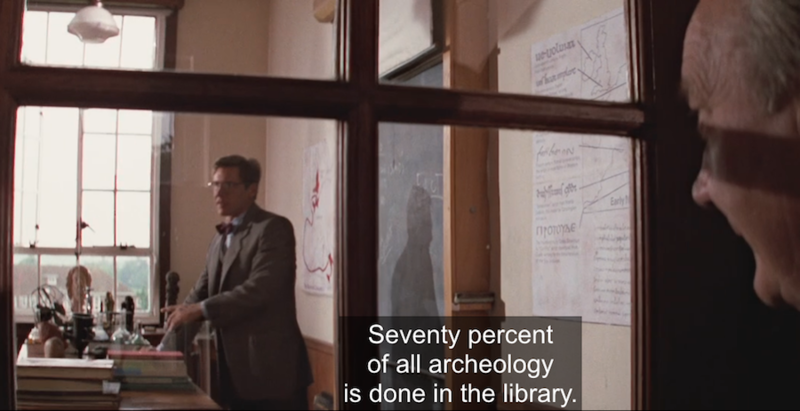 Indiana Jones: That doesn’t look much like a library. Marcus Brody: Looks like a converted church. Elsa Schneider: In this case, it’s the literal truth. Trivia alert: The exterior is St. Barnaba church in Venice, but it’s actually still a regular church, not a library. (Bummer, right?!) The interiors were filmed elsewhere. I love the “X marks the spot” reveal in this scene — harkening back to that pivotal speech in the classroom. And of course the BEST PART of this scene is the reel librarian stamping his books, which exactly syncs up when Indiana Jones hits the floor tiles with the end of a metal post. (Suspension of disbelief? Yep.) It only takes three hits to crack the tile, and the closeups of the reel librarian’s face after each stamp are priceless. He never says a word, yet says SO MUCH through his facial expressions. This reel librarian is a prime example of the Comic Relief character type. The purpose of this character type is the most obvious of all reel librarian roles, to entertain, but the reel librarians of this type do not necessarily entertain themselves or other characters in the film — rather, they entertain the audience. Exclusively minor characters, the Comic Relief librarians serve as the target of jokes, and the audience is encouraged to laugh at them. They are also the most extreme physically — note how the reel librarian in this film is rail-thin, which is emphasized by the slightly oversize nature of his suit. And these physical characteristics are part of the humor; marveling at this heretofore unseen and unknown strength (! ), this reel librarian could not fathom that something other than his stamp could be making noise in the library. First up, I enjoyed the peek at the signs at the end of each bookcase, which give hints about the organization and classification system for this part of the library collection. They’re obviously in the Arts & Literature section of the library, including literature, dramatic arts, and music. I love getting peeks of reel library organization! I watched this film on Amazon Prime, which also provides trivia and goofs. I had never noticed this goof before, that when Indiana Jones gets to the top of the spiral staircase, you can tell the backdrop is made up of book spines glued on a black background, rather than real books. Wow! You can click the screenshot below to view a larger image of it in a new tab. Tip: Look for the shadows on the shelf behind Indiana’s elbow, which reveal that the books are really just book spines. I love this facial and body expression, like Indiana Jones is apologizing for the book spines glued onto the backdrop. The two Dr. Joneses like to think they’re so different — yet they’re so alike! And this goes to the state of their personal spaces, as well. 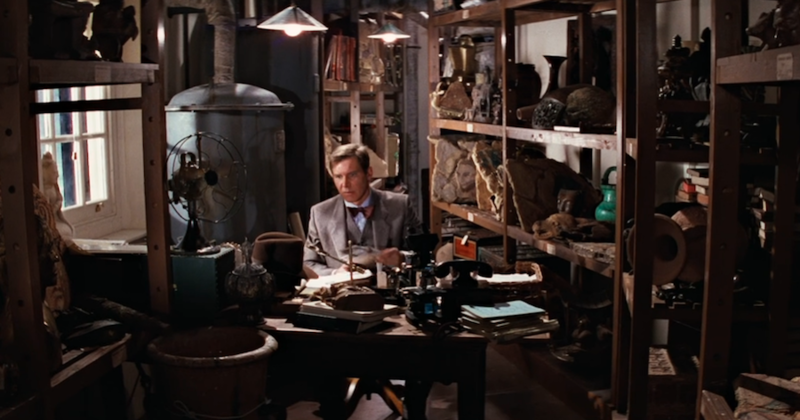 For example, here’s a screenshot of Dr. Jones, Sr., in his personal library at home, in the film’s introductory scenes. The room is lined with bookcases, but none of the items in the bookshelves — books, artifacts, scrolls — look to be very well organized or neatly arranged. Quite disheveled! And the father is dismissive of his own son. 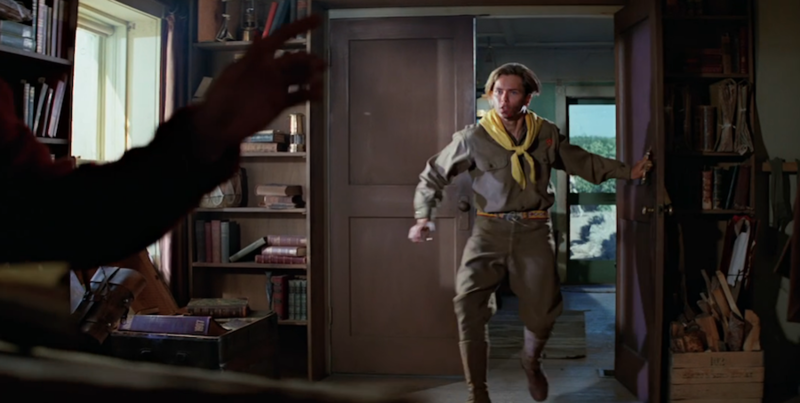 But the younger Dr. Jones is equally dismissive of his own students — he escapes by his office window! — plus his own office, full of bookcases and artifacts, is equally messy. I also appreciate the attention to detail in this film. 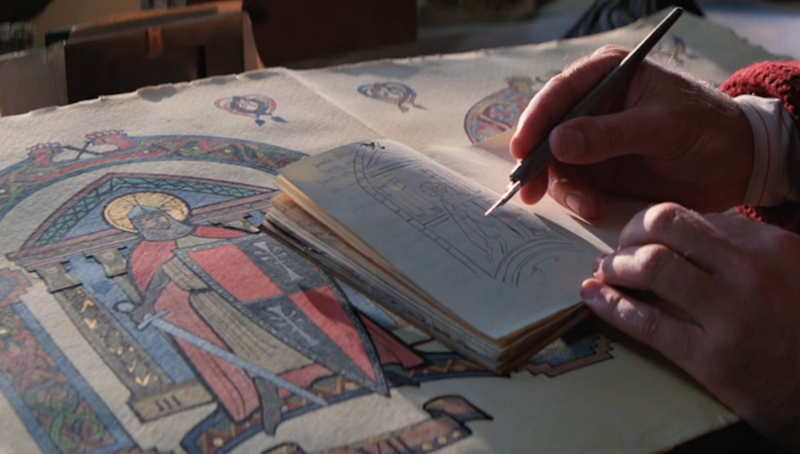 In that same scene I mentioned above, when Young Indy tries to enlist his father’s help, we see a closeup of his father’s hands sketching a stained glass window in a small book. 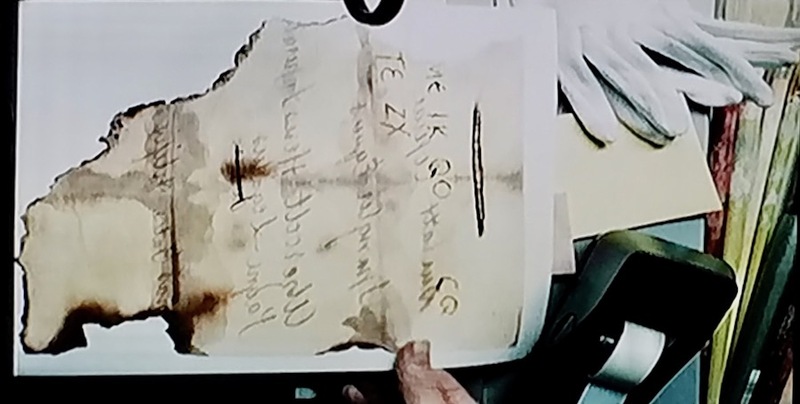 We see that drawing again in the library scene, when Indiana Jones takes out his dad’s diary and flips to the page with the stained glass drawing. … and a peek at the finished drawing of the stained glass window and accompanying notes. Love that attention to detail! And here’s one final thing I noted this time around while rewatching this film. Remember when I said put a pin in the costume Indiana Jones wore while teaching? Let’s revisit that. And I used the word “costume” very deliberately, as Indiana Jones only looks truly comfortable when he’s in his leather jacket and fedora. His entire being — posture, manner, etc. — gets stiff when he’s wearing the three-piece suit and bow tie. Both of them are wearing a three-piece suit, a bow tie, and round eyeglasses. There are differences, of course: Indiana Jones’s suit is lighter in color, and a different texture, while the librarian’s suit looks shabbier, and his collar is more old-fashioned. Both bow ties have polka dot patterns, however, and it’s the same outfit formula. It’s like they’re wearing a uniform to do research! 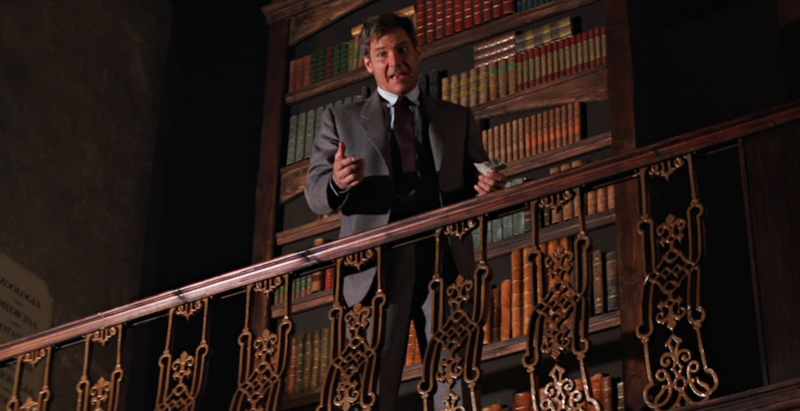 Ultimately, this subtle bit of costume design sartorially links the theme of the library throughout this first part of Indiana Jones and the Last Crusade. Do you remember the library scene from this film? If so, what were your thoughts in revisiting this memorable scene? Did it make you laugh? Please leave a comment and share! Indiana Jones and the Last Crusade. Dir. Steven Spielberg. Perf. Harrison Ford, Sean Connery, Alison Doody. Paramount, 1989. Henceforth, Wong will be known as the Supreme Researcher. Last week, I did a deep dive into analyzing Wong’s reel librarian role in 2016’s Doctor Strange, in the lead-up to this past weekend’s (record-crashing) premiere of Avengers: Infinity War. Below is Benedict Wong’s charming interview — and his Manchester accent! — on the premiere’s red carpet event. “Benedict Wong on ‘Avengers: Infinity War’ Premiere Red Carpet | THR” by The Hollywood Reporter is licensed under a Standard YouTube license. First, my impressions about Avengers: Infinity War in general. Note about spoilers: I will try hard not to spoil the big reveals or the ending, but be forewarned that I might (indirectly) allude to outcomes or clues. Overall, I really enjoyed the movie. The action and pacing kept the story going, and it was truly impressive how the directors, Anthony Russo and Joe Russo, wove in character arcs throughout the multiple locales and action sequences. As one Vox reviewer highlighted, this movie mirrored onscreen how superhero comics do big crossover series in print. That the Marvel Universe managed to pull together all the myriad characters and story threads together — and did it well — is a Herculean feat, in and of itself. I was also impressed with how expressive the CGI was for Thanos. I knew the Purple One was CGI, and yet I could not help but be moved by the genuine emotion captured in Thanos’s face — or rather, how they managed to capture actor Josh Brolin’s acting and emoting underneath all the CGI. I mentioned last week that the director of Doctor Strange had hinted that Wong had an important role in Avengers: Infinity War. And Wong had scored his own character poster, which featured him conjuring magical shields with his hands. Wong plays a part in one of the major battle scenes near the beginning of the movie. Thanos has dispatched his Black Watch baddies, using a “divide and conquer” strategy, with Ebony Maw and Cull Obsidian heading toward New York to retrieve the Time Stone from Doctor Strange (the stone is in the Eye of Agomotto). Bruce Banner also comes hurtling through time and space and (literally) crashes into the New York sanctum. He then warns them of Thanos. 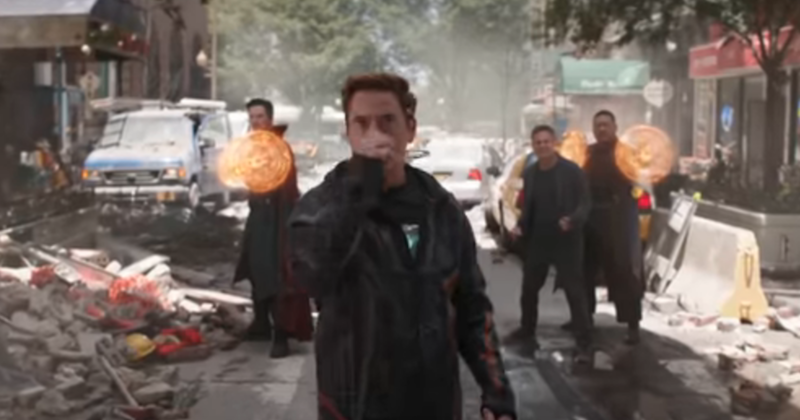 Tony Stark — who was conveniently in Central Park with Pepper — quickly joins Banner, Strange, and Wong. Wong then goes into teacher/librarian mode and explains the stakes to Stark and Banner, through an illusion casting of the Infinity Stones. Wong is efficient and straightforward in this exposition, identifying and naming each Infinity Stone. This scene essentially functions as an abbreviated form of Wong’s Infinity Stone lesson to Strange in Doctor Strange; in that film, Wong did the illusion casting in the Kamar-Taj monastery, home to the monastery library. But in this film, it makes sense that Wong conjures the Infinity Stones in the entrance of the New York sanctum. We never get to see Wong the sorcerer librarian in his monastery library, but it is nice to see him using his librarian skills to help set up the stakes — and the plot of the entire movie — to members of the Avengers, as well as to the audience. Side note: There is an Avengers: Infinity War prelude comic that reveals that Wong knows a LOT about the Infinity Stones, more than anyone else does. This suggests he has done some serious research in tracking down the history and provenance of each Infinity Stone, befitting his role as the Kamar-Taj Librarian. Henceforth, Wong will be known as the Supreme Researcher. Back to the action… once again, Wong is just in time with his lesson, because the foursome then immediately square off against Ebony Maw and Cull Obsidian. Banner has trouble turning into the Hulk — there’s a funny bit when Tony Stark says something like, “You’re embarrassing me in front of the wizards!” — so Wong takes up the charge of protecting Banner. A quick note that amidst all the action, Wong does land a few jokes, including one about a favorite flavor of ice cream, delivered in his usual deadpan style. Ebony Maw ultimately captures Strange, and Stark and Spider-Man — who has since joined the crew — pursue Maw’s ship. This leaves Bruce Banner to contact Captain America and Wong to defend the sanctum. Ultimately, Wong serves the same role and fulfills the same character types as he did in Doctor Strange; he serves as both an Information Provider and Comic Relief. Will we get to see Wong again? Again, I will not (directly) spoil the end of the movie, but be warned that I may (indirectly and vaguely) allude to outcomes or clues. If Wong returns in the second movie, then he might be key to restoring the world order. After all, he may turn out to be one of the only (if not the only?) Masters of the Mystic Arts left. However, Benedict Wong is not (currently) listed on the cast list for the Infinity War sequel, scheduled to be released next year. But that cast list is very short — only about three dozen names are listed as yet — so I will be on the lookout for any more news or clues of Wong. Have you seen Avengers: Infinity War yet? Please leave a comment and share your thoughts — but no direct spoilers, please! Adams, Tim. “Infinity War Prelude Comic Shows Wong Is More Important Than We Knew.” CBR.com, 28 Feb. 2018. Avengers: Infinity War. Dir. Anthony Russo and Joe Russo. Perf. Robert Downey Jr., Chris Hemsworth, Mark Ruffalo, Josh Brolin, Benedict Cumberbatch, Benedict Wong. Marvel Studios, 2018. Romano, Nick. “Avengers assemble in 22 Infinity War Character Posters.” Entertainment Weekly, 4 April 2018. Snoek-Brown, Jennifer. “Sorcerer Librarians of ‘Doctor Strange’.” Reel Librarians, 25 April 2018. “Untitled Avengers Movie (2019): Full Cast & Crew.” IMDb.com, 2018. VanDerWerff, Todd. “Avengers: Infinity War is Like a Really Short Season of a TV Show.” Vox, 1 May 2018. “Wong.” Marvel Cinematic Universe Wiki, 2018. Librarians should get hazard pay for the very real dangers that come with the job. The sure-to-be-a-smash-hit Avengers: Infinity War opens this weekend, and if you’re a fan of the Marvel Universe series of films, then you’ll know that one of the (many, many) characters and heroes of the Marvel Universe is sorcerer librarian Wong, who was first introduced onscreen in 2016’s Doctor Strange. Wong made the Avengers: Infinity War‘s promotional poster, in the upper right corner, and he scored his own character poster, as well. And there are a few glimpses of Wong in the first trailer (at 10 seconds, 46 seconds, and 1:02 minutes) that was released back in November 2017. “Avengers: Infinity War Trailer #1 (2018) | Movieclips Trailers” uploaded by Movieclips Trailers is licensed under a Standard YouTube License. Before we rush to see the new film in the Marvel saga, let’s get to know the sorcerer librarians from Doctor Strange a bit better, yes? The first library scene in Doctor Strange is also the first scene of the film, period. The librarian is shelving books in the Kamar-Taj monastery library. The villains, headed by Kaecilius (Mads Mikkelsen), break into the library and string up the librarian. They kill the librarian in order to gain access to the chained-up books in the restricted section, and Kaecilius then rips out a secret spell from one of the books, which we later learn is the Book of Cagliostro. Such is the power of knowledge, eh? Librarians, who in this context are literally the gatekeepers to forbidden knowledge, should get hazard pay for the very real dangers that come with the job. This reel librarian, listed in the credits as the “Kamar-Taj Librarian,” is played by Ezra Khan, and he does get more backstory in one of the digital comics, Doctor Strange Prelude – The Zealot. This comic helped fill in some of the plot points and motivations for characters in the film, including prior interactions between the Kamar-Taj Librarian and Kaecilius. The library entrance is dark and full of shadows, with dim lighting — like the inner sanctum of the library itself — and this is where the librarian’s desk is, a wide and solid wood desk stacked with papers and books. The walls are lined with overstuffed bookcases. Wong wears burgundy robes, fitting his station as a Master of the Mystic Arts. His head is shaved, and he does not wear glasses. Wong introduces himself with one word, his name. Doctor Strange tries to make a joke out of his one name (“Just Wong? Like Adele? Aristotle? Drake? Bono? Eminem?“), which becomes a running joke throughout the film. Wong ignores him and reads the titles of the books Strange has brought back (Book of the Invisible Sun, Astronomia Nova, Codex Imperium, and Key of Solomon), and then invites Strange on a tour of the library. We get to see much more of the library — dimly lit with lamps, of course — which has rows of bookcases that slide in and out, full of books individually chained up. A very interesting shelving system! Wong: This section is for masters only but at my discretion, others may use it. You should start with Maxim’s primer. [He unchains a book.] How’s your Sanskrit? Strange: I’m fluent in Google Translate. Wong: The Ancient One’s private collection. Wong: No knowledge in Kamar-Taj is forbidden. Only certain practices. Those books are far too advanced for anyone other than the Sorceror Supreme. Wong: That’s the Book of Cagliostro. A study of time. One of the rituals was stolen by a former master. The zealot, Kaecilius. Just after he strung up the former librarian and relieved him of his head. I am now the guardian of these books. So if a volume from this collection should be stolen again I’d know it, and you’d be dead before you ever left the compound. Strange: What if it’s just overdue? Any late fees I should know about? Maiming perhaps? Wong responds in silence and hands him a stack of books. Strange: People used to think that I was funny. Wong: Did that work for you? Strange: All right. Well it’s been lovely talking to you. Thank you for the books… and for the horrifying story… and for the threat upon my life. Wong nods, turns, and chains up the book again. This scene lasts only three minutes, but wow, does it pack a punch! And Wong establishes his sorcerer and warrior bonafides with the bare minimum of dialogue and facial expressions. In his first scene, Wong has already established himself as one of the most interesting and dynamic reel librarian characters EVER. A few minutes later, at 43 minutes into the film, Strange returns to the library. Wong is sitting in his chair by the front table. He gets straight to the point. Strange: Books on astral projection. Wong: You’re not ready for that. Strange: Try me Beyonce. Oh come on, you have heard of her right? She’s a huge star. Do you ever laugh? Oh come on just give me the book. Strange is not one to take “no” for an answer, so the next scene demonstrates how Strange bends the rules to get what he wants. It’s a seconds-long scene played for comedic effect. The central joke is that Wong, sitting at his desk while Strange steals books literally behind his back, is listening to Beyonce’s “Single Ladies (Put a Ring on It)” song, which can be heard through his headphones. Of course he knows about Beyonce! This scene also hints at Wong’s (hidden) sense of humor. The joke is ultimately on Strange, as it’s clear that Wong misled him about his knowledge of Beyonce, in order to put a check on Strange’s big ego. Ancient One: Like the rule against conjuring a gateway in the library? Strange: Wong told on me? Ancient One: Trust your teacher, and don’t lose your way. I like that last line, because it clearly designates the reel librarian as a teacher in his own right and someone to be respected. After all, he is a Master of the Mystic Arts, like the librarian before him. Yep, librarians are educators, too. Almost 50 minutes into the film, Strange heads back to the library, which now appears empty. Strange calls out to Wong; hearing no answer, he then heads straight to the restricted. Because OF COURSE. Strange grabs the Eye of Agomotto — which is itself an Infinity Stone and therefore very powerful — and figures out how to turn back time. He then uses the spell to resurrect the torn-out pages in the Book of Cagliostro. While I appreciate that he repaired the book — Strange could have a second career repairing books in libraries across the globe! — this was very reckless behavior. Wong and Mordo (Chiwetel Ejiofor) then burst in. Time to teach Strange a lesson. Strange: I was just doing what was in the book. Strange: I don’t know. I hadn’t gotten to that part yet. Mordo: Temporal manipulations can create branches in time. Unsuitable dimensional openings. Spatial paradoxes. Time loops! You wanna get stuck reliving the same moment over and over forever or never having existed at all? Strange: Really should put the warnings before the spell. Wong: Your curiosity could have gotten you killed. You weren’t manipulating the space time continuum, you were breaking it. We do not tamper with natural law. We defend it. Again, Wong steps up and exposes the consequences of Strange’s rash actions. At the same time, he highlights how the Kamar-Taj librarians are not just defenders of the books in the library, they are also defenders of natural law. More exposition time! This scene continues with Wong leading a lesson about the scope of what the Masters defend and explains the roles of the Ancient One and the three sanctums of power, Hong Kong, New York, and London. Wong also explains about Dormammu, the evil force that Kaecilius has sold his soul to. Wong’s lesson is not a minute too soon, because right after he finishes, they learn that the London sanctum has fallen, and that the New York sanctum is under attack. Strange gets sucked into that dimension and fights Kaecilius for the first time to defend the New York sanctum. Wong then picks up his own weapon, which looks like some kind of club relic. And he stays true to his word, going outside to head Kaecilius off before he can enter the Hong Kong sanctum. The two square off, and Wong readies for a fight. Unfortunately, we don’t actually get to see Wong fight. By the time Strange arrives on the scene, the Hong Kong sanctum has fallen, and Wong has been defeated, dead in the rubble. But luckily, Strange knows how to turn back time, so he manages to resurrect Wong, whose chest had been punctured by a rebar. In the midst of all the action and drama, Wong then provides two unexpected doses of comic relief. First is Wong’s stunned reaction after Strange resurrects him. Strange expects a lecture from the librarian. Strange: Breaking the laws of nature, I know. Wong: Well, don’t stop now. Strange then figures out a way to beat Dormammu and get rid of the zealots, who get sucked up into Dormammu’s dimension. Strange makes a quip that echoes his earlier schooling from Wong and Mordo. Strange: You should have stolen the whole book, because the warnings come after the spells. Wong [laughs]: Oh, that’s funny. Both Strange and Mordo stop and stare at Wong, who is cracking up and shaking with laughter. This is the first time Wong has smiled, let alone laughed! The films ends in the library, the same location where it began. As Strange puts back the Eye of Agamotto, Wong then sets up the upcoming Infinity Wars showdown. Wong: Wise choice. You’ll wear the Eye of Agamotto once you’ve mastered its powers. Until then best not to walk the streets wearing an Infinity Stone. Wong: You might have a gift for the mystic arts, but you still have much to learn. Word of the Ancient One’s death will spread through the multiverse. Earth has no Sorceror Supreme to defend it. We must be ready. The two Kamar-Taj librarians we meet, one who begins the film and Wong who ends the film, primarily serve as Information Providers. We see the first librarian onscreen for perhaps a total of 30 seconds, while Wong has a much bigger supporting role, with scenes throughout the film. Wong never really changes; he is steady and steadfast. He is who he is, a Master of the Mystic Arts and guardian of the library and natural law. And even though his laughter at the end of the film is surprising, we already got hints earlier in the film that he had a (hidden) sense of humor. I would argue that Wong, along with nurse Christine Palmer (Rachel McAdams), is one of the only characters in the film who remains completely trustworthy. He never loses faith in his mission, and the audience never loses faith in Wong. I would also argue that that trust also stems from the fact that he’s a reel librarian, as librarians are often used in cinema as shortcuts to establish trust. Reel librarian roles are also frequently used to provide exposition and lead to clues that propel the plot forward. In each scene, Wong does both. Benedict Wong is also a first-class actor whose facial expressions and voice lend instant authority and credibility to the role. And thanks to his voice acting and verbal expression, his expository speeches never fall flat. Wong also serves as Comic Relief throughout the film. His deadpan facial expressions and non-reactions to Strange’s jokes at the beginning of the film help lighten the mood, and the audience joins Strange in amazement when Wong cracks up at one of Strange’s jokes at the end of the film. When I was preparing screenshots I took while watching my DVD copy of the film, I noticed that when Wong is shown with another character (usually Strange) and in a stationary position (i.e. not walking across the screen), he is shown almost always on the right side of the screen. I would argue that Wong — ever loyal, ever steadfast — is (almost) always on the right side of the screen because he is always right, period. He’s intelligent, he’s dedicated, he’s ready to defend what he believes is right. It’s visual affirmation that what Wong believes is right IS right. Kaecilius tries to goad Wong before the Hong Kong fight, taunting Wong that he will “be on the wrong side of history.” But we know better. Wong will remain on the right side of history. I think Wong is shown on the left side of the screen in this scene to underscore the strangeness of this moment. The director breaks his visual shortcut for Wong’s character just as Wong breaks character by laughing aloud. It’s a subtle, but very clever, touch. In the comics, Wong is depicted as Strange’s “tea-making manservant.” The director, Scott Derrickson, also co-wrote the script, and he changed Wong’s character from an Asian stereotype to a more active role. I applaud this change, because Wong ends up a very interesting character and an inspirational reel librarian. I also have to admit that it was very nice to see not one, but TWO, reel librarians of color featured in this film (even though one literally ends up, err, on the chopping block). Although it’s clear that he did fight with Kaecilius in the Hong Kong showdown, we do not actually see Wong perform martial arts in the film, thereby avoiding another Asian cinematic stereotype. I wanted to give a shout-out to Stan Lee’s cameo in Doctor Strange, which clocks in at 1 hour and 18 minutes into the film, during the chase and fight scene between the zealots and Strange and Mordo. Stan Lee is seen on a bus, reading a book and laughing, oblivious to Strange and Mordo slamming into the side of the bus. The book Stan Lee is reading is Aldous Huxley’s The Doors of Perception, a book of Huxley’s experience taking psychedelic drugs and how that influenced this art. This cameo most likely plays off the long-held association between psychedelic drugs and the kaleidoscope imagery of the Doctor Strange comics (something Marvel disputes). Stan Lee laughs uproariously at the book he’s reading in this cameo, so perhaps he is dismissing this decades-long notion? Director Derrickon has also hinted that Wong has a significant role to play in the upcoming Avengers: Infinity War film. We shall see! I plan on watching it this opening weekend and reporting back next week with a “First Impressions” type of post. Are you looking forward to the Avengers: Infinity War film? Have you seen Doctor Strange? Please leave a comment and share! Doctor Strange. Dir. Scott Derrickson. Perf. Benedict Cumberbatch, Chiwetel Ejiofor, Tilda Swinton, Benedict Wong. Marvel Studios, 2016. Mellor, Louisa. “Exclusive: Benedict Wong on new direction of his Doctor Strange role.” Den of Geek, 27 June 2016. Schaefer, Sandy. “Official Avengers: Infinity War Poster Unites the MCU Against Thanos.” Screen Rant, 16 March 2018. Willmore, Alison. “Orientalism Is Alive And Well In American Cinema.” Buzzfeed News, 4 April 2018. I believe that “Conan the Librarian” and “Chainsaw Sally” would be a match made in heaven… or hell?! Let’s explore the love and gore, shall we? 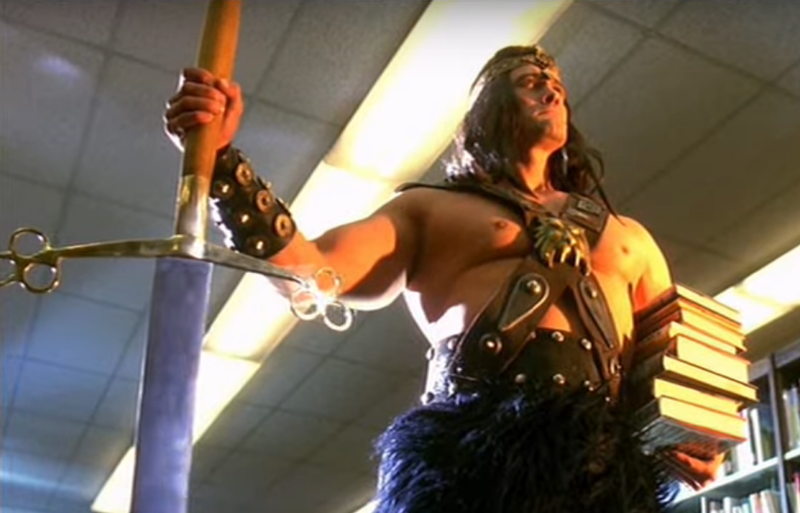 “Conan the Librarian” is a brief — but memorable — character featured in a brief sketch in the Weird Al Yankovic film, UHF (1989). The character is introduced in the form of a television ad for a show on an almost-bankrupt public TV station. “Conan the Librarian” is a parody of the famous “Conan the Barbarian” character created by R. E. Howard, and the clip lasts only 40 seconds. But it’s enough time for two scenes featuring “Conan the Librarian’s” wrath. Conan then goes on to slice a young man in two because his books were overdue. “UHF Conan The Librarian,” uploaded by sirstrongbad, 2006, is licensed under a Standard YouTube license. “Chainsaw Sally,” the title character in the indie 2004 film, wreaks havoc on library patrons all throughout her film. What counts as a killable offense in Sally’s library? A woman who never returns a book she checked out. A woman who works at the local ice cream truck misspells “malt” on an order form and also makes fun of Sally when Sally tries to correct her misspelling. “Scene From Chainsaw Sally,” uploaded by OneMinuteReviewer, 2011, is licensed under a Standard YouTube license. Both films are cult classics, and both characters are quite memorable. Both films are also comedies, although on different points on the comedy scale. (UHF often feels like a long series of comedy bits and sketches, while Chainsaw Sally is more of a dried-blood “dark comedy.”) Conan also serves as Comic Relief while Sally is the ultimate Naughty Librarian. So much to bond over! Chainsaw Sally. Dir. Jimmyo Burril. Perf. April Monique Burril, Mark Redfield, Alec Joseph. Shock-O-Rama Cinema, 2004. UHF. Dir. Jay Levey. Perf. Weird Al Yankovic, Victoria Jackson, Kevin McCarthy, Michael Richards. Orion, 1989.